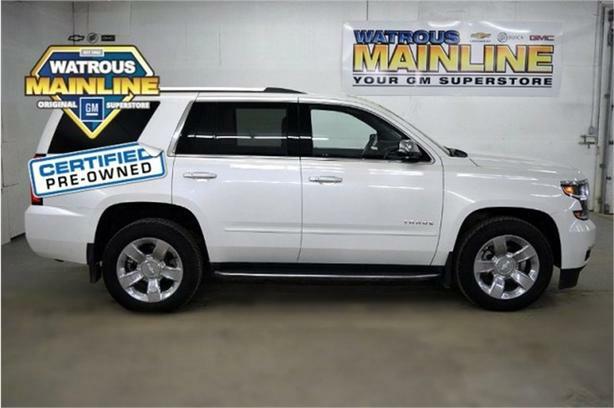 Grand and graceful, this 2016 Chevrolet Tahoe represents a faultless convergence of unparalleled power and beauty. With a Gas/Ethanol V8 5.3L/325 engine powering this Automatic transmission, it is a vastly understated assertion of your dominion over the open highway. It comes equipped with these options: Headlamps, high intensity discharge, WHEELS, 20 X 9 (50.8 CM X 22.9 CM) CHROME, TRANSMISSION, 6-SPEED AUTOMATIC, ELECTRONICALLY CONTROLLED with overdrive and tow/haul mode, (CF5) power sunroof, (U42) rear seat DVD entertainment system and (IO6) Chevrolet MyLink radio with navigation, 3.42 rear axle ratio and (JL1) Trailer brake controller. and ENGINE, 5.3L ECOTEC3 V8 WITH ACTIVE FUEL MANAGEMENT, DIRECT INJECTION AND VARIABLE VALVE TIMING includes aluminum block construction (355 hp [265 kW] @ 5600 rpm, 383 lb-ft of torque [518 N-m] @ 4100 rpm) (STD) . Visit Watrous Mainline Motor Products Ltd at 208 1st Avenue East Box 70, Watrous, SK S0K 4T0 today.